a Beyond Myanmar representative and tour guide. Barge ride on the Royal Lake. Tour of the city centre as well as the gilded 2,500 year old Sule Pagoda. Shortly before sunset, visit the 107 meter high golden stupa of Shwedagon Pagoda which glitters in the soft light of the early evening. Transfer to airport for flight to Mandalay. Arrive in Mandalay, check into hotel. Visit Mahaganyon Monastery, the home of more than 1000 monks. Visit U-Bein Bridge for a walk over the world’s longest teakwood bridge. Kyauktawgyi Pagoda (a large Buddha image carved out of a single block of marble). Shewnandaw Monastery (Golden Palace) noted for its exquisite wood carving. Kuthodaw Pagoda known as the World’s Biggest Book for its shone slabs of Buddhist scripture. Sulamani Pagoda and Mandalay Palace. In the evening enjoy the sunset from Mandalay Hill. Depart Mandalay on a private boat along the Ayeyarwaddy River to visit Mingun, a village on the west bank of the river. Visit Mingun Pathotawgyi, the world renowned Mingun Bell. Tour of Myatheintan Pagoda and surrounding villages. Proceed to Sagaing Hill – known as the centre for meditation. Hill sides are dotted with numerous pagodas and Monasteries. Visit Khaungmudaw Pagoda, Soon U Ponya Shin Pagoda, Pottery Making village and Silver-smith workshop. In the evening, transfer to airport for flight back to Yangon. 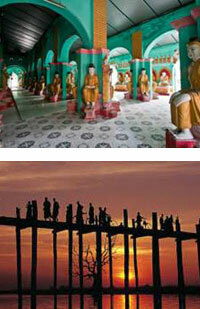 Yangon half-day sightseeing includes Botahtaung Pagoda, Nanthida Jetty. Visit Bogyoke (Scott) Markets for souvenirs, shopping at gems market and handicraft shops. Internal flights + boat + car.